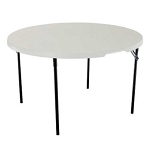 We often are asked questions about seating capacity of round folding tables. This post will hopefully elaborate this issue, perhaps more than you wanted to know. Round folding tables inch the market typically come inch 3 sizes: 48 inch diameter, 60 inch diameter, and 72 inch diameter. While design and structure of the legs differs between manufacturer, all other parts of the tables are generally the same or similar. So, the big concern is going to make sure each seating position has enough workable space. To start this process, we will take a look at an easier seating example for Rectangular Folding Tables. The 72 inch x 30 inch Lifetime folding table is going to be an excellent starting location. For every foot of length, Lifetime suggests that 1 additional adult can comfortably be seated. So, for a 6 ft. rectangular table, 6 adults can be seated; and for an 8 ft. table, 8 adults can be seated. The distribution of seats at the table inch the 6 ft. case is 3 adults on each side. So, 72 inches inch length divided by 3 seating locations is 24 inches inch width for each seating location. The table, is 30 inches deep, so each seating location will have 15 inches of depth to work with. 24 inches x 15 inches means each location inch the 6 ft. rectangular folding table example will have about 360 inches squared to work with. What we now will want to do is create as close a comparison for 360 inches squared as we can for a round folding table. To keep our numbers as simple as possible, we will first calculate seating capacity for a 48 inch diameter round table. The circumference of a 48 inch round table is 48 x pi (3.14159 will be used), or 150.79 inches. To get us a sectional circumference - by essentially slicing up the table area into 6 pieces of a pie - we divide 150.79 by 24, which was our width of a seating position for a 6 ft. table inch the rectangular table example, and we get approximately 6 positions available. Now to verify the amount of space available per position. To get the square-inch space, we calculate the area of the table top, which is 24 inches squared x pi (3.14159 will be used), and then divide by 6 to get the per-position, square-inch space. This turns out to be 301 inches squared per position. How important are those extra 60 square inches? You will have to decide based on your desired activity and use; but, for most occasions, a 48 inch round folding table should seat about 6 people comfortably. Using this same calculation procedure, the circumference of a 60 inch diameter table is 188.50 inches. This provides sectional space for about 7.85 positions. Each of those positions will have about 360 inches squared to work with. This total brings us back to our familiar total from the rectangular table example above. For most situations, a 60 inch diameter table seats 8 adults comfortably. Finally, we come to the 72 inch diameter round table. The circumference for this size of table is 226.19 inches, which creates about 9.42 positions. This number seems to tend toward losing a position; but, when you look at the square-inch space for each position, you will see you have ample room for an additional space. After calculating the area of the 72 inch table, we see that each of the 9.42 positions has about 432 square inches to work with. Even if you consider that with this large of table each person seated at the table will not be using all of their available space into the center of the table, you still have ample room to add that last .58 of a position to your table. So, 72 inch diameter tables are typically able to seat 10 adults comfortably. Good article, thank you. I signed to your rss feed! I follow your blog site for quite a long time and must tell that your content articles always prove to be of a high value and quality for readers.